Goomba's Worth is the eighth level of Bowser's Castle in the Minion Quest: The Search for Bowser mode in Mario & Luigi: Superstar Saga + Bowser's Minions. Prior to the start of the level, Ludwig summons the other Koopalings, and decides that if Captain Goomba is indeed the one who led his minions this far due to his indispensable loyalty to Bowser, then he and his squad should prove his worth against the Koopalings. 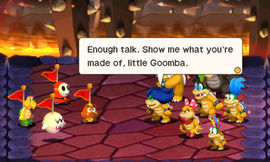 The Goomba Squad battles Mechakoopas, Lakitus, Fly Guys, all Magikoopa colors, and all of the Koopalings themselves. After the test battle, Ludwig, though hesitant to admit it, confirms that his test was indeed a success, and that Captain Goomba had indeed been an effective leader. Together, the Koopalings and the Goomba Squad go out to face Fawful. This page was last edited on April 19, 2019, at 17:06.